Susanne from Benny fibers in Montana gave me this skein of yarn at OFFF and I wanted to thank her so wove a little pouch using the 4×6 Mutli and noticed that this color-way wove up into a really nice Scottish looking plaid so decided to make up a school suit for my AG doll. I think it turned out really nicely. I also made a dress for Skyler Hopscotch. Weaving is such fun! 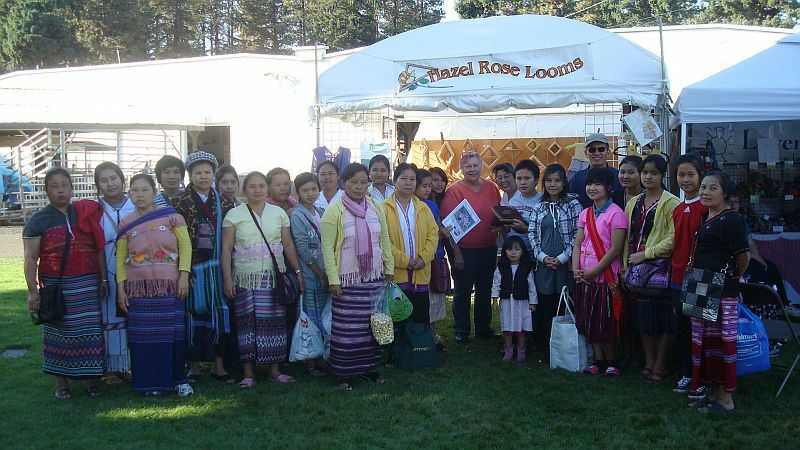 We had a great time at the Oregon Flock and Fiber Festival this year. The weather behaved and was just perfect, sunny and warm but not too hot. Lots of people came to enjoy the activities. We met and made new weavers and met a lot of weavers from years past. It was a very nice weekend. This picture shows a very new weaver! She’s just 6 years old. She told me that she already knows how to crochet so it is not surprising that she caught right on to weaving as well. 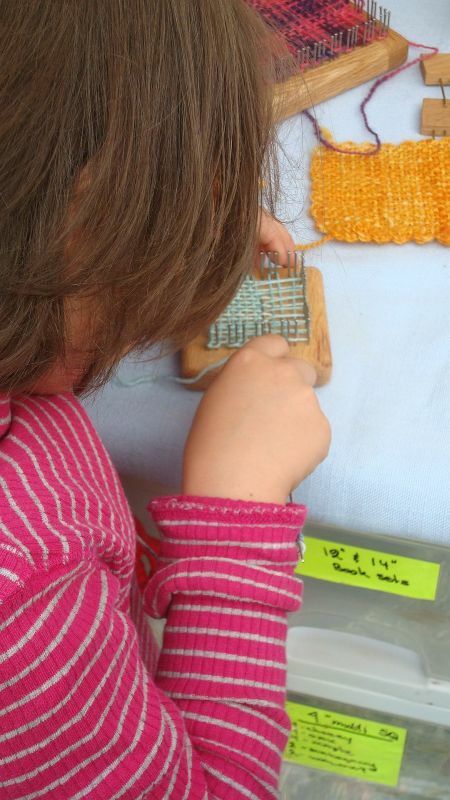 She finished her little square here and Mom bought her her own loom. I am sure it will not be long before she has many projects to share. She went off happily to find yarn! And here’s little Hazel Rose. She’s not so little any more, she now 3 years old, but as pretty as ever. 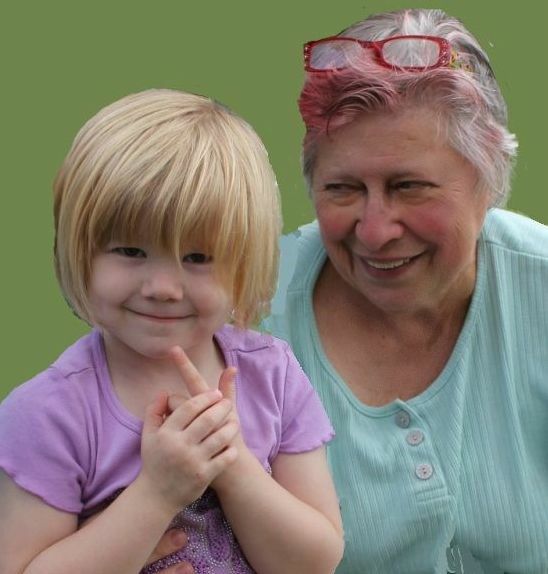 We met another young Hazel there, too, but I did not get her picture. And then a large group came by. Not all of these people came into the booth at once, of course! They are refugees from Burma and several of them were very interested in the looms and this kind of weaving. They are all, or most all, weavers themselves and were wearing lovely examples of their weaving skills, but found this kind of weaving new to them. A small group of them came in and tried their hand at weaving the Quilt Weaver square. I gave them a copy of my book and I was asked to sign it. First time I’ve been asked for my autograph! lol We enjoyed a nice long visit. We also had a brief visit with Hazel Rose, who is now three years old. Mom took a photo, which I hope she will share with me. Hazel was in a hurry to get to the animal barn and see the interesting stuff so I didn’t think of my own camera until it was too late! lol And we got to visit with friends from Hamilton, Montana, who are at OFFF every year with their lovely yarns and fleeces. We hope to be visiting them next spring at their Big Sky show. 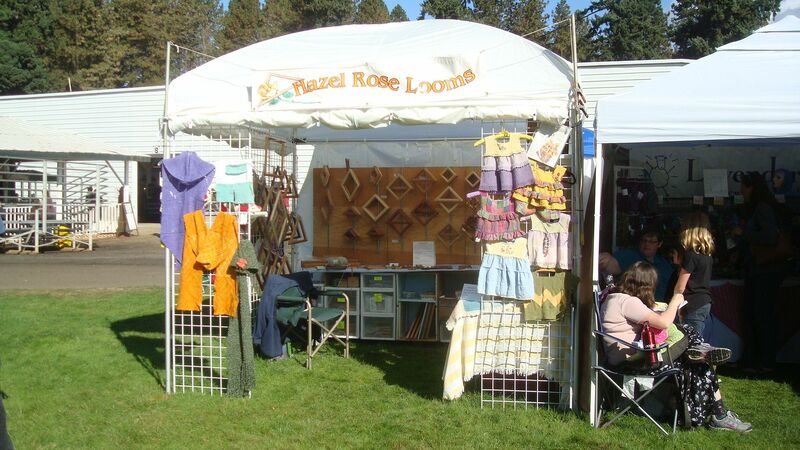 But now we are going to be busy people as we have just barely a month before we are to be in Monroe, Washington for the Fiber Fusion fair up there. We have a lot of looms to replace in stock. And don’t forget that if you are within reach of Grants Pass, Oregon in November I’ll be having a class there at Fiber Mania. Sign up now. I think it will be a lot of fun. We had a great time in Arcata at the Natural Fiber Fair but I came home with a ‘gift’ from someone. Sore throat, coff, head ache… Not bad, but certainly not good. I’m sure I’ll be over it soon. Meantime, I am working on projects as usual. 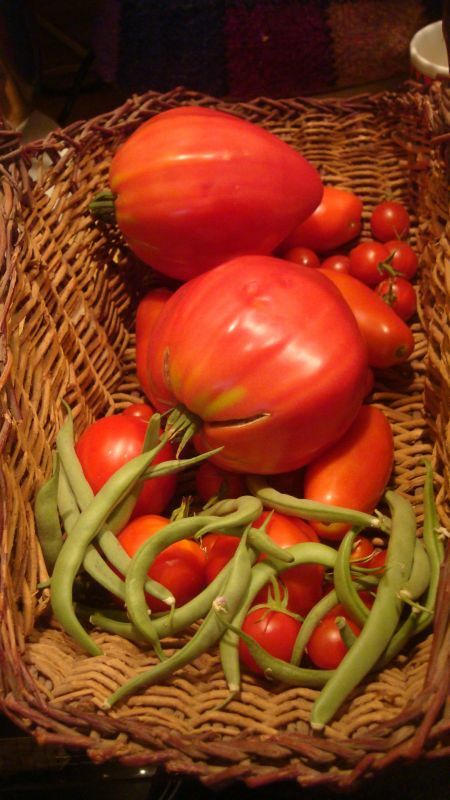 And the tomatoes are getting ripe at last. I think I have an orange one, too. These are heirloom Oxheart. They average almost a pound a piece & are very tasty. There’s also one early girl, a roma type, and some cherries. This is the basket I made for Momma to pick her asparagus in. It’s long a narrow, I used willow and our native blackberry vines. Wishing everyone safe from fire and storm. I’m taking the cats to the pet motel tomorrow and getting the dog washed. 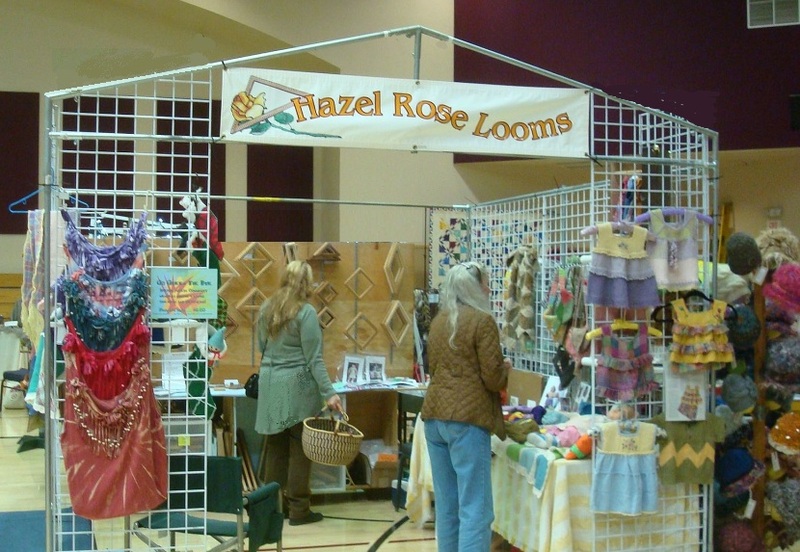 We head out Friday to Natural Fiber Fair in Arcata to join in the fun there for our first time. This fair has been going on for 22 years but it’s the first time we’ve been part of it. I am looking forward to it. And it’s on the coast, which will be fun, too. as the weather is perfect! The end of the month is the Oregon Flock and Fiber Festival and we’ll be OFFF to it in a couple more weeks. 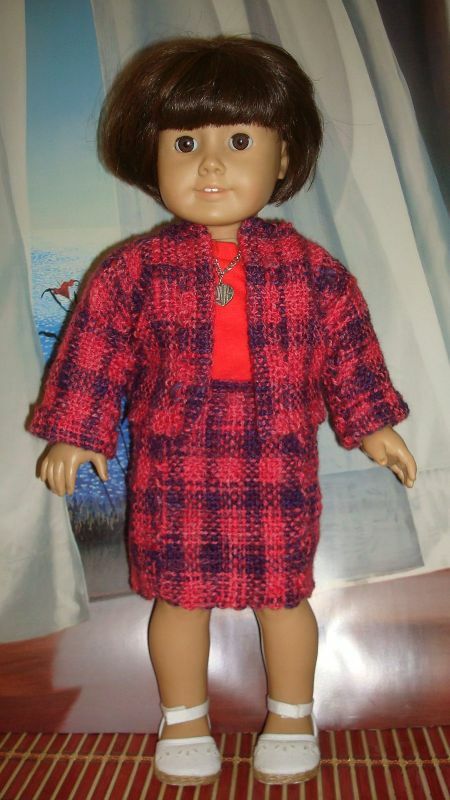 Today on American Girl Knitters on Ravelry we discussed a Weave ALong to be tentatively set for January/February. that will be fun , too. We’ll weave a doll dress, of course! Speaking of dolls… I got a new one today. She’s an American Girl, too. An older one, no longer made by Pleasant Company. I knew she was coming in just her undies so i found some patterns from fellow dollers and had some waiting for her. Now that she’s here for me to fit I can start weaving her wardrobe, too! Meet Skyler! She’s having a bad hair day just out of the box but is in great shape elsewhere. She even stands up. her mini skirt is just a tad too mini but the sweater fits just fine.